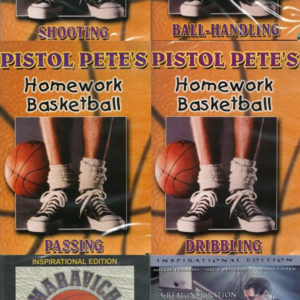 Pistol Pete’s Homework Basketball training series is an in-depth training series made by Basketball Hall-of-Fame Legend Pistol Pete Maravich. These basketball training drills were developed by Pete and his father, Press Maravich and are the same drills that Pete practiced when he was a young up-and-coming player. 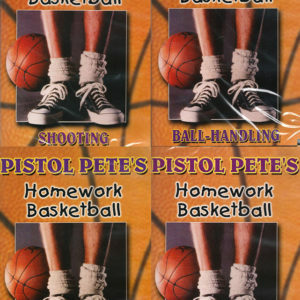 Pistol Pete’s Homework Basketball training series is designed for players of all ages and skill levels. 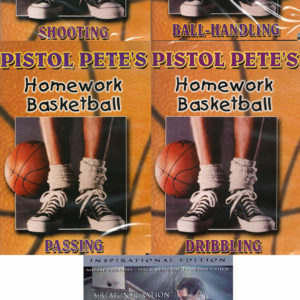 Whether you are new to the game of basketball or an experienced pro, Pistol Pete’s Homework Basketball series will help improve your skills and make you a better basketball player. Announcer: The legend is back! With the most exciting and innovative approach to learning the game of basketball. In the glow of the steel mills of Pennsylvania he began to sharpen his skills to a razor-sharp edge. After thousands of hours of practice, sweat, toil, and pain a legend was born that would change the game. With his own special style and mastery unmatched comes an instructional video series that will challenge even the best: Pistol Pete’s Homework Basketball. Now here’s a sneak preview of this four tape instructional series. Pistol Pete’s Homework Basketball video on shooting is the most complete instructional ever devised on the art of shooting a basketball. And who better to learn from than the man who rewrote the record books, “Pistol Pete” Maravich? Pistol Pete didn’t just play the game, he was an offensive machine with a phenomenal 3,667 points as college basketball’s all-time leading scorer. That’s more than 44 points a game. For ten years he thrilled and entertained NBA crowds with his shooting expertise, bombarding the nets with more than 15,000 points. Pistol Pete Maravich: I’m Peter Maravich. During my basketball career I earned the nickname “Pistol Pete” because of my shooting technique. I can teach you the same techniques of shooting that helped me become the NCAA’s all-time scoring leader, if you’re willing to do your homework. 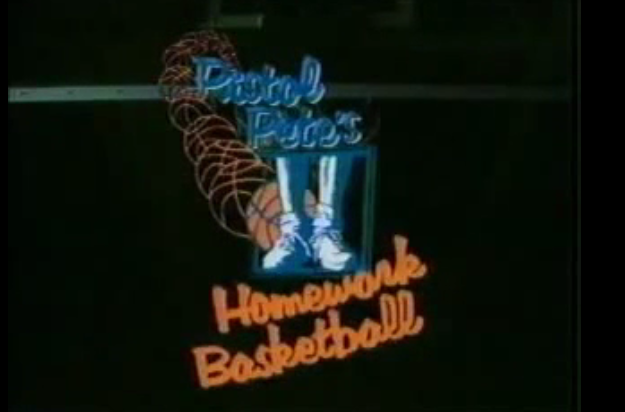 Announcer: It’s all here in Pistol Pete’s Homework Basketball. Designed for kids of all-ages, Pete’s approach will instruct and entertain aspiring youth, as well as challenge the most ardent basketball enthusiast. Pete Maravich: Top of the backboard. Who’s going to get up there and get it? Michael Jordan can’t get that ball up there, I’m telling you. Announcer: Pistol Pete puts the fun in the fundamentals of basketball, teaching you the art of shooting the way he learned it. Included in the tape are: how to master the basics, the psychology of shooting, and the application of Pistol Pete’s techniques for every type of shot including the jump shot, the lay-up, the hook shot, as well as an array of shots that will push any player to his limits. Peter Maravich: The level of success that you attain depends upon your God-given talent and ability, good instruction, and practice, practice, practice. Remember: Don’t forget to do your homework. Announcer: Dribbling like you’ve never seen it before. No other single video can offer the many faceted combinations of instruction, motivation, and the one of a kind drills that made Pete Maravich a basketball legend. Different strokes, the laid-back, and scrambled eggs are just a few names that will forever become etched on a viewer’s mind. Peter Maravich: Scrambled eggs. Another creative fundamental drill of dribbling. Scrambled eggs. Okay? Scrambled eggs dribble. All those different parts. It’ll scramble your brains for a while. You’ll be very frustrated when you do it. But remember this: Stay with it. Stay with that commitment. You can do it! Once you do it, you’ll find yourself being able to come out on the court. You’ll be able to set things up, you’ll be able to take that ball and go anyplace you want with it because your hand will become an extension of it. That’s a tremendous creative fundamental drill, just for you. Dribbling blindfolded. That’s what I used to do when I was eight to nine years old. Hey, I had fun! It was so much fun for me to come out and dribble blindfolded! Announcer: A master of the unexpected pass, Pistol Pete will keep viewers on the edge of their seat as they see a true artist at work. This superb technician not only takes you through the basics, but he will push any player to their limits. Pistol Pete: Passing. That’s what we’re here today to do. How to learn how to pass. I’m going to teach you not only the mechanics of passing, the basic four passes, the fundamentals of passing, but I’m also going to teach you today how to do the creative, the more “dance” type of pass. The artistic type of pass. The deceptive pass. Announcer: Homework Basketball is a way of learning the game. A way of mastering the game that is unmatched by any other instructional series. Peter Press Maravich: Now you’ve just learned how to throw the chest pass, the chest bounce, the overhead, and the baseball pass. Four basic fundamental passes, but there’s one mistake that all kids make, and that is they telegraph the pass. “Telegraph? What do you mean?” I’m showing where the pass is going to be made. I’m looking down, I get ready to throw, and the defensive man knocks it down. I do it again, he knocks it down. Again, he knocks it down. Again, he knocks it down. I keep telling myself, and the coach says, too: “Why do you telegraph your pass, Pete? Don’t you know how to fake?” That’s what I want you to know, right now. You have to fake. Fake. All you got to do is fake. Announcer: Whether the viewer’s goal is to just make the team, or even to make the Hall of Fame, if they practice their homework they’ll have everything they need to give them the edge over any opponent. Ball handling skills. To Pistol Pete they’re the key to playing your best game. They’re simple to learn, but they take a lifetime to master. What looks like a total impossibility in the beginning becomes a possibility with the Pistol’s help. Singer: Ooh, you make it look so good! This boy is hot! Every move, march, and rhythm…how can I get what he’s got? Who is to say, today, who will be a legend tomorrow? Tomorrow, it’s so far away…if we start today! He’s the heir to the dream. He’s the one, and only, Pistol! Backup singers: He’s the Pistol! Singer: He’s the heir to the dream. How can I get what he’s got? Ooh, when you’re watching…you can see he’s doing it right. Backup singers: This boy is hot! Singer: Ooh, and when it all comes together…makes it worth fighting the fight. Who can say, today, who will be a legend tomorrow? Tomorrow, it’s so far away…if we start today! He’s the heir to a dream. He’s the one, and only, Pistol!